to mean that the tax should be levied in a manner humiliating to the taxpayers. 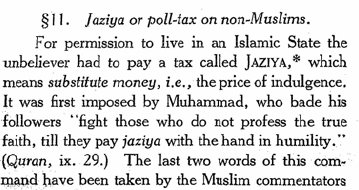 As the scholars and divines of the time informed Aurangzib, the books on Muslim Canon Law lay down that the proper method of collecting the jazia is for the zimmi to pay the tax personally; if he sends the money by the hand of an agent it is to be refused; the taxed person must come on foot arid make the payment standing, while the receiver should be seated and after placing his hand above that of the Zimmi should take the money and cry out, "0, zimmi! pay the commutation money." Women, children below fourteen, and slaves were exempted from the tax; blind men, cripples and lunatics paid only when. they were wealthy; monks were untaxed if they were poor, but if they belonged to rich monasteries the heads of these religious houses had to pay. 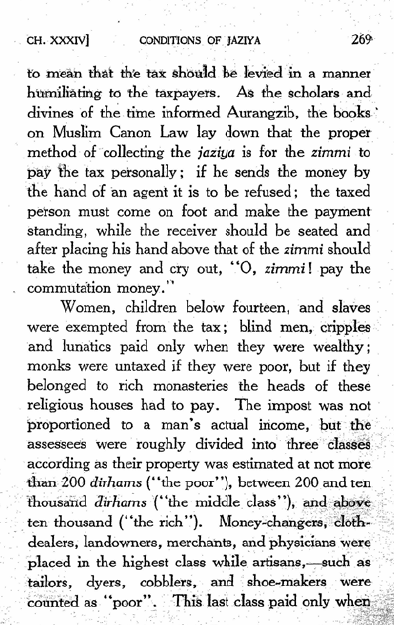 The impost was not proportioned to a man's actual income, but the assesses were roughly divided into three classes according as their property was estimated at not more than 200 dirhams ("the poor";, between 200 and ten thousand dirhams ("the midcle class"), and above ten thousand ("the rich"). Money-changers, cloth-dealers, landowners, merchants, and physicians were placed in the highest class while artisans,—such as tailors, dyers, cobblers, and shoe-makers were counted as "poor". This last class paid only when their professional income left a margin above the cost of maintaining themselves and their families. Beggars and paupers naturally escaped the tax. The wise statesmanship of Akbar abolished the tax and removed an invidious badge of degradation from the majority of his subjects (.1579). 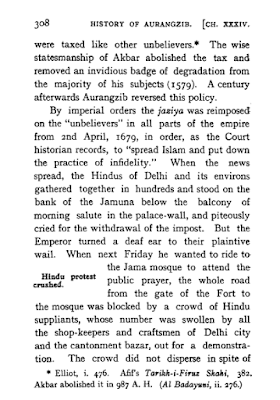 A century afterwards Aurangzib reversed this policy. and the Emperor after waiting vainly for an hour ordered elephants to be driven through the mass of men, trampling them down and clearing a way for him. The Hindu protest continued for some days, but in the end the Emperor's firmness triumphed and the subject people ceased to object. A temperate and reasoned letter from Shivaji urging the impolicy of the new impost and appealing to Aurangzib to think of the common Father of mankind and the equality of all sincere beliefs in God's eyes, met with no better success. 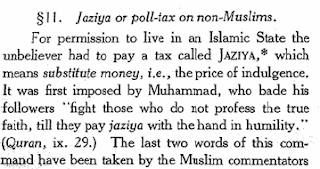 In levying the jaziya, Aurangzib was deaf to the pleadings of pity and political expediency alike. 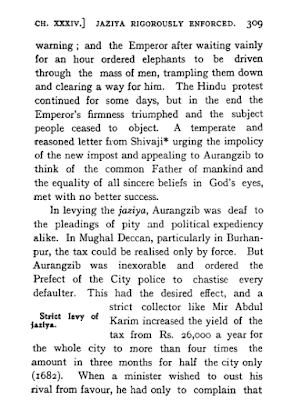 In Mughal Deccan, particularly in Burhanpur, the tax could be realised only by force. 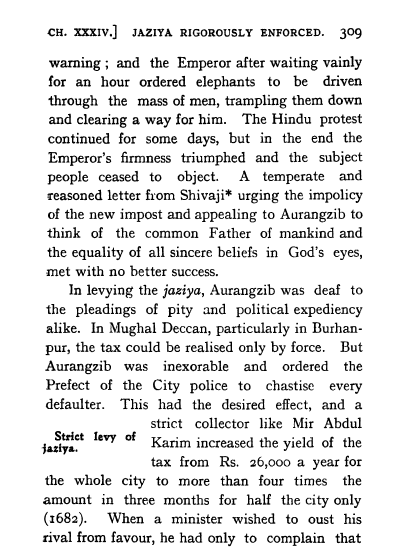 But Aurangzib was inexorable and ordered the Prefect of the City police to chastise every defaulter. This had the desired effect, and a strict collector like Mir Abdul increased the yield of the tax from Rs. 26,000 a year for the whole city to more than four times the amount in three months for half the city only (1682). 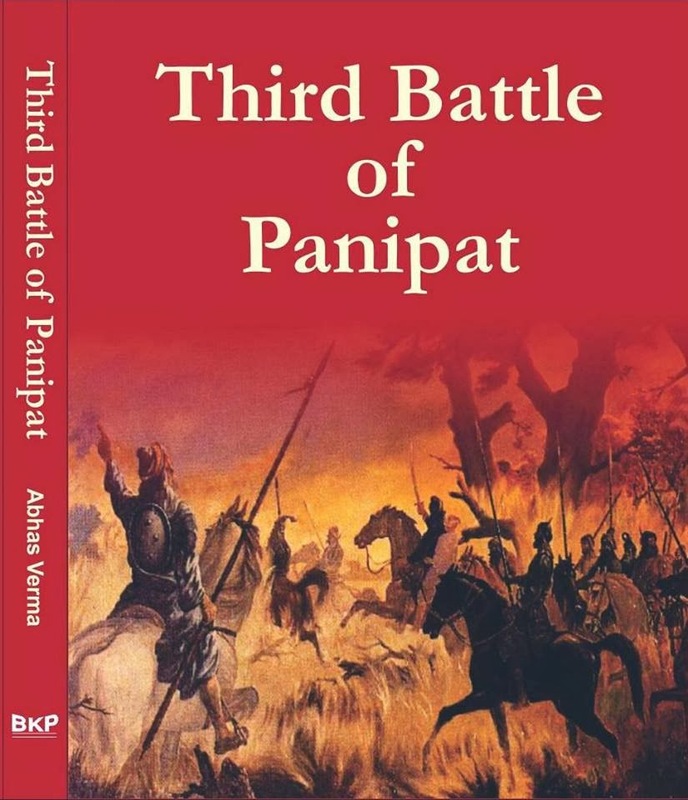 When a minister wished to oust his rival from favour, he had only to complain that the latter had excused some Hindus from paying the poll tax and the Emperor would plainly tell the lenient revenue minister, "You are free to grant remissions of revenue of all other kinds ; but if you remit any man's jaziya—which I have succeeded with great difficulty in laying on the infidels, it will be an impious change (bidat) and will cause the whole system of collecting the poll-tax to fall into disorder." Again, when the enforced levy of this tax scared Hindu traders away from the Mughal territory in the Deccan and caused scarcity of grain in the camp of the Imperial army, Aurangzib vetoed his general's proposal to suspend the jaziya in that locality. His soldiers might starve, but should he jeopardize his soul by violating the Quranic precept to take jaziya from the infidels ?